The only commodity that never loses its value in any market is the truth. People talk about virtual scarcity but easily forget that what’s really scarce right now is trust. When talking about the internet we often use the word virtual which comes from the word virtue. It means something like merit, high moral standards and has associations with courage and valour. The internet is what’s important to us. It’s an abundance of activities and objects listed in a randomly accessible way with the complete removal of space and almost all economic barriers. The only thing that guides us online is how much we care. Just take a look at how much effort we go to in order to feel safe when relying on each other. Look at the data mining companies like Facebook and LinkedIn, there to track our actions, solicit data entry with fields covering our legal identities, habits and skills. Could it just be the excuse we need to contract with with each other? One of the downsides to removing space as a feature of our world is that it’s much easier to treat someone like an object when you can’t look them in the eye. Sat behind a computer screen people look like objects and thinking of someone like this can often lead to treating them as one. Back in December we saw @FTClover, real name Shane, join the forum, and for several months all seemed well, he was active, participating in discussion and suggesting ideas. Which is why when his project to launch a Cloud Mining company turned out to be a scam it came as such a shock to all of us. If we want to improve the way we overcome the limitations of the physical laws first we have to be careful in creating the ones we make for ourselves. We need to set the rules of the community according to how we really are rather than the way we hope to be. Ruthie’s has laid out some guidelines and we welcome your input. – The length of time they have been a member of the forum. – The type of interaction they have had with forum Admin, Staff and Team. – Do they have proof of their business working; if they have their own website address consider how long it has been running and whether their services have been used before. – Twitter / Reddit, this is just a small example of where to look. I ask you to be careful and always check before handing over any funds. Kevlar has been working hard, having spoken to Shane he has suggested coming back with a report and a plan of action ahead. Note that Kevlar has also kindly offered escrow services for future funding efforts. The marketplace is full of temptations and this is a problem everyone should be worried about, we would not like to let this be a repeat of the way Tradefortress was handled over on Bitcointalk where everyone just forgot about it, leaving him to create a new identity and possibly do it again. The worst thing of all would be if we let what happened with FTClover spoil it for everyone else. 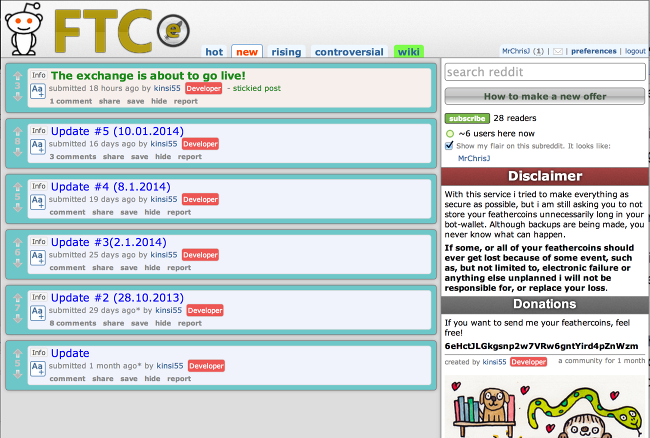 So I am delighted to tell you about the Reddit Feathercoin Exchange! Recently two people joined our forum, @Kinsi and @motherlode to tell us they were planning to launch a Local Bitcoins style exchange on Reddit where they were already moderators of one of the Feathercoin mining forums. Kinsi says he has been coding for more than 4 years and is currently on an apprenticeship. He made this software to solve his own problem when he noticed that buying Feathercoins was so hard. I have been speaking with the guys on Skype for about a week now and would love to help them prove their product that is already delivered and working. It launched yesterday and we want to do a call out for users to help bootstrap the project. This is a great opportunity for professional day traders to set up a small business in distributing Feathercoins and investing in a reputation score that can put value back in to the community. Please note @Kinsi’s warning in the sidebar: do not put anymore coins on the exchange wallet than necessary. This is always a good idea for all types of exchanges. The software doesn’t touch the fiat transaction, which is done using traditional methods such as bank transfer or paypal, but be careful of chargebacks. In the UK the Faster Payments using online banking have no chargeback facility. At least 400 comment karma. At least 1000 combined karma(link+comment). An account that is at least 4 months old. This is to keep the scammers out! To get started make your way to the Wikipage where you will find a list of the shortcodes with handy buttons that help prepopulate the fields. Have You Updated Your Feathercoin Wallet? Checkout the new splash screen, now make sure you have updated by the 31st January! We had another great meetup in Oxford on Saturday. We had many new faces including a couple of guys, who we think made it all the way over from Holland to see us! It wasn’t entirely clear but we were very grateful at any rate and we have taken their email so that we can talk to them more at length. Make sure you have signed up to the Feathercoin Meetup Page and let us know if you would like to host one in your area. Harriet (51:13) was unhappy because she was on camera without wearing any makup – which is fine because neither was I! We also did one of our signature livestreams, and yes it was full of the usual chaos and gaffs but somehow it keeps you all intrigued so hopefully overtime I will get better at doing them. I was joined by my long time friend Harriet, who I dragged on to the camera. We often have long rambling conversations on the phone, putting the world to rights and I wanted to see if it worked on camera. We also had a great conversation with Hull City Council who were looking for some advice and guidance on how they could leverage cryptocurrencies at the local level as a way of helping the poorest members of our society. Since our conversation we have been invited up to Hull to sit and chat with them (without the stress of the cameras!). I really look forward to reporting back on this, I was over the moon at their initiative and they travelled such a long way to see us. Bianca, the barmaid, was curious to know what all the fuss was about. She got a lesson in crypto from @Uncle_Muddy. Did you know she jumps out of aeroplanes for a living? Check it out, I got issue number 1 of 24! These Laser Etched Feathercoins rock; not least because they look great; they’re handmade; and with a few tweaks it will be possible for you to control the private key stored inside the coin. This is a common problem among many physical wallets, the manufacturer creates the key pair which means you never really know if you can trust them with your wealth. Can’t wait until the next one, which the Oxford Blue want to do next month. And finally. I cannot believe I left this out of last week’s news letter! @BitsBeTrippin are a bunch of guys we love having around and they came on the forum not so long ago to tell us that the Feathercoin Logo features in their new promo video. Not to mention one of their sponsors has made them a T-Shirts featuring Feathercoin alongside Bitcoin and Litecoin. The cool mining T-Shirts can be purchased on the Hollow Wear website although wearing one as you walk past the hundreds of CCTV cameras everyday will somewhat undermine the pseudonymity of cryptocurrency! Parasites help us discover the people who work the hardest. They act as a signal that what lies beneath their surface must have a lot of value, else why would they be drawn to them in the first place? Most people get hung up on Scammers and choose to get angry and I would like to propose an alternative way of framing the problem, because all the technology in the world will never overcome the human failings. Trustless systems don’t make trust less important, if anything it makes it vital and I hope together we can hold Shane to account. I hope we can all learn something from the experience.